Lock in a great price for Travaasa Hana – rated 8.6 by recent guests! Location in paradise . Just that the hotel is outdated but maybe it’s just the way they want to be . Special place on earth really ! The Best thing about this Hotel is the Excellent Staff. They epitomize the meaning of “Aloha”. You can have the best Hotel in the world, and in the best location, but without a Great Staff, you don’t have anything special. Many thanks to all the beautiful people who made our stay so wonderful. location and the super friendly staff, great yoga. 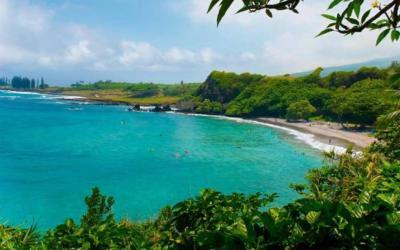 So glad that we decided to stay in Hana, and drive the southern route around the rest of the peninsula the next morning. Delicious dinner and breakfast; beautiful and very large room. Wish we could have stayed longer to enjoy some of the activities and classes. Very friendly and helpful staff; lovely grounds. 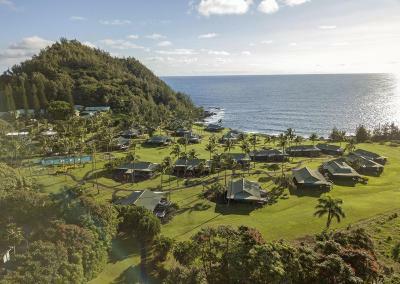 A very nice resort (albeit the ONLY resort in Hana) that gets away with a bit of highway robbery. The location is a amazing, the grounds are very nicely kept. 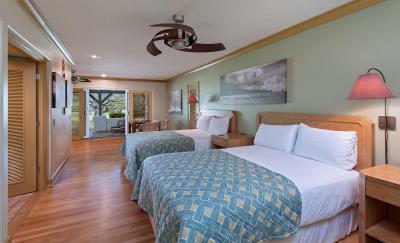 If you're dead-set on staying in Hana and open to splurging, it's worth a night or two. 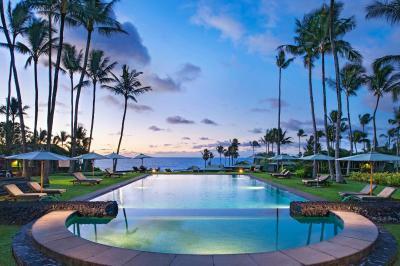 The pool and view are amazing, as are the resort's proximity to some of the best beaches in the world. Increadible bungalow with kitchen, bed, couch, open arrangement, very beautiful and aristic, like you would imagine living in a tropical paradise. 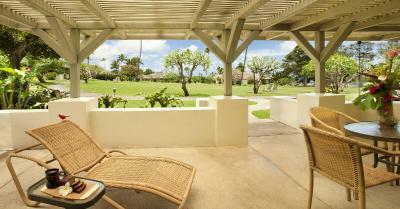 Nice big porch with an ocean view to sit and relax. There is no TV, which made my entire stay more relaxing. The staff were amazing, catering to your every desire, very professional and genuinely helpful. 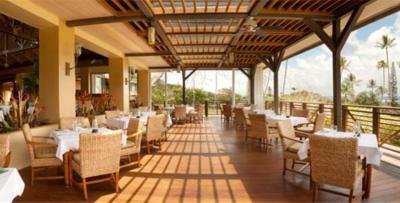 I liked the restaurant, which had a delicious menus, very nice ambiance, and beautiful view. Overall, it is expensive, but you get an amazing experience worth the money. It was nice having laundry facilities on property to do your own laundry. It is a beautiful site and the people were friendly. Remoteness, bungalow rooms with deck, pool and hottub - absolutely gorgeous, food was excellent - great new chef! 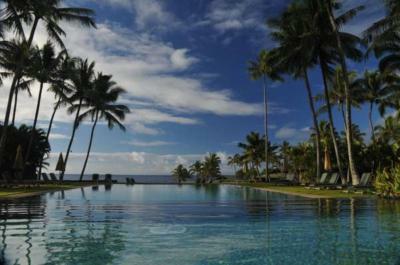 Travaasa Hana This rating is a reflection of how the property compares to the industry standard when it comes to price, facilities and services available. It's based on a self-evaluation by the property. Use this rating to help choose your stay! Each cottage features a terrace with ocean views, a complimentary loaf of banana bread, and a refrigerator with complimentary bottled water. 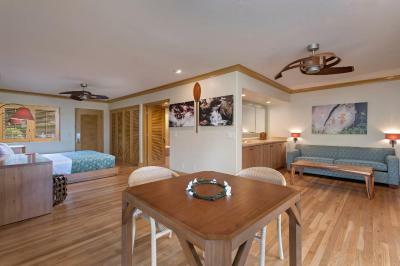 Suites offer a fully equipped kitchen and a TV with cable channels in the living room. 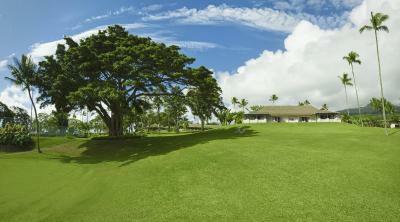 Ka’uiki Restaurant is located on-site and serves Asian-infused breakfast, lunch, and dinner. 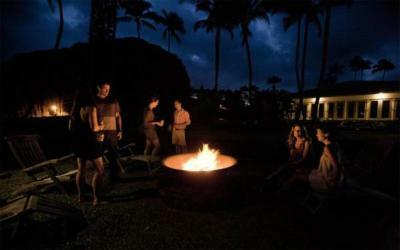 The unique Polynesian dishes can be enjoyed with local wines and beers at Hana Travaasa. Guests can take classes on mixology, the art of making a cocktail, as well as learning to make smoothies. 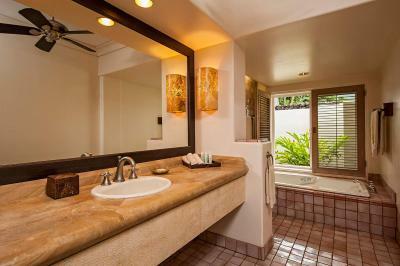 The Spa at Travaasa Hana offers massages, body treatments, and facials. 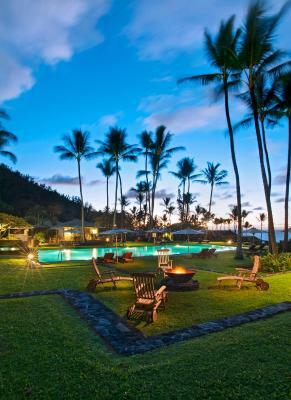 An outdoor pool and hot tub are provided at this resort. Outdoor activities include canoeing and stand up paddleboarding, bamboo pole fishing, Hawaiian net throwing, and bicycle rides. 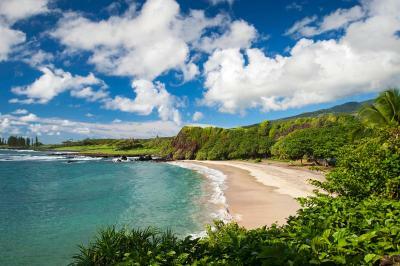 Wai'anapanapa State Park is 6 minutes’ drive away from Travaasa Hana. 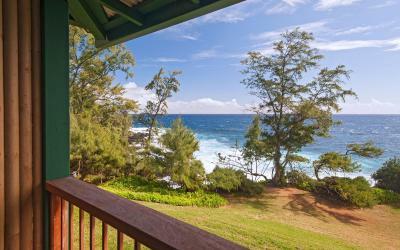 This property also has one of the top-rated locations in Hana! Guests are happier about it compared to other properties in the area. 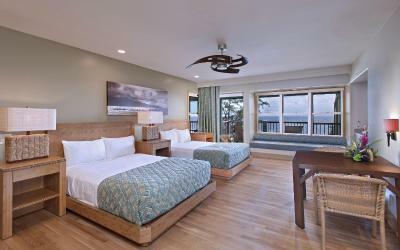 When would you like to stay at Travaasa Hana? 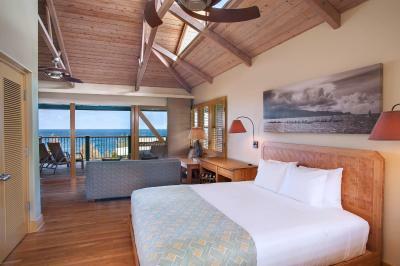 Featuring a terrace with garden views, this family-friendly suite also has a separate sitting area and whirlpool bathtub. 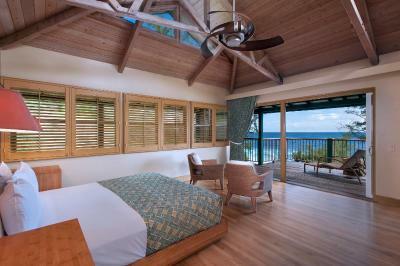 Featuring a terrace with sea views, this adults-only cottage also has a separate sitting area and spa tub. Please note: A maximum of 2 guests can stay in this cottage. 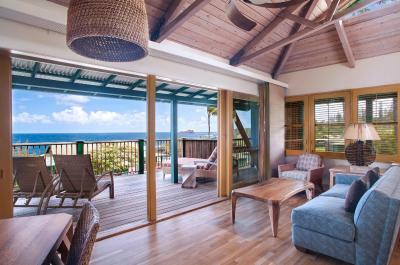 Featuring a terrace with sea views, this spacious adults-only cottage also has a separate sitting area and spa tub. Featuring a terrace with sea views, this adults-only cottage also features a separate sitting area and soaking bathtub. 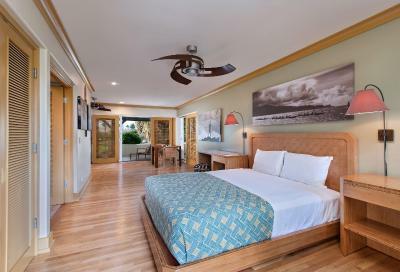 This double room has a private entrance, sofa and bathrobe. This family room features a spa bath, sofa and private entrance. House Rules Travaasa Hana takes special requests – add in the next step! Travaasa Hana accepts these cards and reserves the right to temporarily hold an amount prior to arrival. Rooms are too big and uninvited also outdated . I really can’t think of anything that I did not care for. too few healthy vegetarian food options. a bit overpriced! Very small town, with not much choice of eating establishments in the evening. Gas is super-expensive. We had a very roomy semi-detached bungalow with lots of privacy. Very comfortable, and it was a pleasure to sit out on the veranda at sundown and watch the world go by. 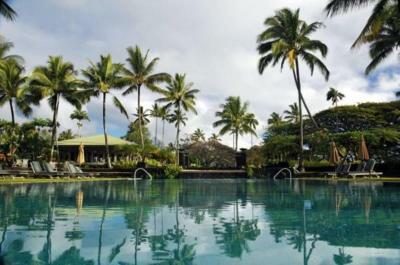 The resort is in Hāna, a long way from the main Maui airport, but worth the drive. Reservations at the main restaurant fill up quicker than I’d like, but the staff is kind and worked to find a solution. Beautiful property. Gorgeous rooms. Extremely helpful staff. An amazing experience. We will be back!! Nice hotel in the jungle and giving an unique experience there. The rooms are large but poorly designed and decorated, and the price per night is VERY high considering what you actually get. 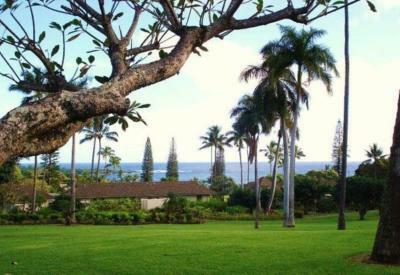 The resort is a bit dated, but that's expected considering it's the only resort in the very small and quiet town of Hana. The dining options in Hana are very limited, and the Preserve Kitchen & Bar (attached restaurant) is really the only 'fine' dining option in Hana - albeit very expensive, along with most things in Hana. 1.Super high room rates 2.No AC in the room. So the windows and doors have to be open. No noise proof at all. Feel robbed. Not worth the money. Even though we had paid in full, they decided to put the price up when we checked out and charged us an extra $50. Actually worried we may get charged twice, no hotel is worth the total we paid, considering nothing is included. Nice, large room. Easy to find within the town. Friendly staff. Do not expect 5* luxurious hotel. It is rather 3* with its look back in the 60s. Be prepared that you will pay way too much than it would be reasonably expected. The hotel us outdated and totally overpriced yet - absolutely charming. 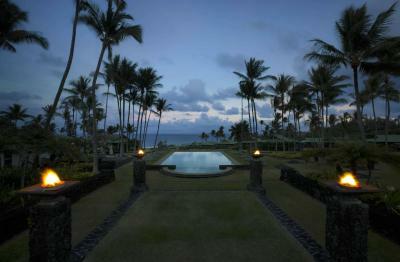 You can enjoy tranquil and geenfull place, feel the slowly spirit of Hana. 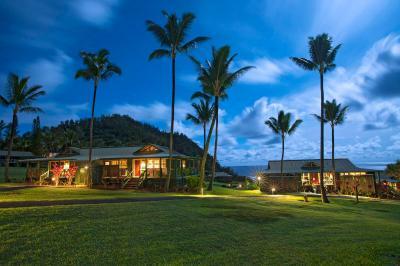 In my opinion this place is a must for couple of nights in order to fully enjoy the beauty of road to Hana. Rooms have no air conditioning. Restaurant was very overrated. We both had the chef's special (at $42 per serving). The fish was not particularly tasty and the sauce was bland. My wife said that the green beans could have come from Birds-eye. The grounds and facilities were beautiful. The room was large and very well appointed. The staff was very friendly and helpful. I think that while being a fantastic location the charges for the rooms are a bit excessive. They are a bit older and fairly basic. However we were not uncomfortable in any way. You are paying for the location. The hotel restaurant is not the best (the choices are narrow and not really inspired) and we preferred going the The Ranch a short walk away and you can charge the costs to your room there as well. 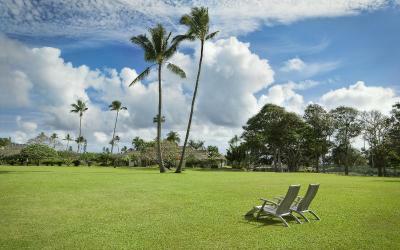 This location is idyllic in Hana and the best place to stay when there. It is a gorgeous location and really is unparalleled. The staff is great and I particularly liked the 'no tipping' policy at the hotel. This is a great idea and makes for a more enjoyable stay. We took the ukulele course as well and that was great fun. Warm service from all the staff, especially Rory! They were all consistently great and we were greeted with smiles all over the resort. They also made the effort to remember our daughter’s name. Rooms are huge! Lots of activities to choose from. Food at the restaurant were delicious! 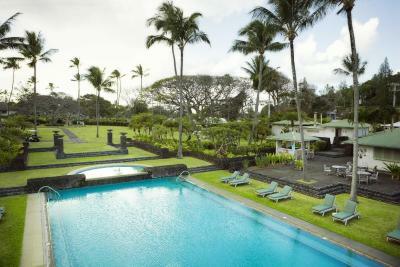 Go for the infinity pool and enjoy a few refreshing cocktails.